Clarets boss Sean Dyche admits he is enjoying the ride as Burnley look to end a remarkable season with European football. With seven games to play, his side remain seventh in the Premier League, on target for their highest finish since 1975, when they were 10th in the old First Division. 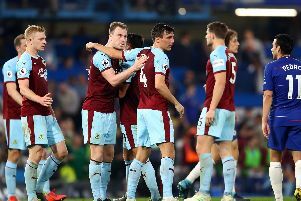 Burnley travel to 11th place Watford on Saturday, before they host Leicester City the following week – with the Foxes currently three points adrift in eighth. And with a trip to sixth place Arsenal still to come – who are five points better off than Burnley – there is much to play for, with seventh place likely to mean Europa League qualification. The Clarets were last in Europe in 1966-67 when they reached the last eight of the Inter-Cities Fairs Cup. Dyche hasn’t been drawn on that prospect, but he said after the 2-1 win at West Broom on Saturday – a third-successive victory: “It’s building a nice story. “For all I play it steady, it doesn’t mean I don’t enjoy it. “I can assure you I’ll enjoy this with my kids and have a nice cold glass of beer watching Match of the Day. “But I’ve still got to temper it with the realities of the industry we’re in. “I stay on my guard, you never know what’s round the corner. Dyche knows there are no guarantees at this level, in a season where the likes of West Brom, Southampton and Stoke – who many would consider “established” clubs are struggling: “It’s tough, it’s not easy. We’re not strong enough to guarantee we’re going to hit this marker and that marker, we’re just not there yet. “We’ve moved forward from last season, but not to the point where we can tick off ‘we can beat them and beat them’. He knows he is at a club where there are sensible expectations, however, regardless of where Burnley finish this season: “I’ve signed again, I like what we’re doing here, I’m 46, I’m learning, the managers who have been in it for years and years have been through phases where they have to learn, and that’s what I think I have to do, and I get the freedom to do that. “There’s still a demand, and the demand changes, and it will because we’re doing even better than probably expected, but underneath that, there’s a club that knows year on year it’s a challenge to be in the Premier League, so there’s a balance to it.